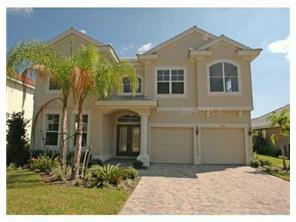 This Stunning home is situated in one of the nicest new neighborhoods in North Tampa. This home has never been lived in and is ready for immediate occupancy. This fine Family home in an established neighborhood is ideal for entertaining and has a perfect location, ten minutes from Downtown and a short drive from everything the Tampa Bay Area has to offer. As you enter the home you are greeted by a beautiful chandelier hanging 22 feet above with a grand staircase leading you up to a balcony overlookingyour foyer and family room. The brightly lit living room and dining room have crown moulding with neutral paint and carpet. The kitchen features 42' spiced maple cabinetry with quartz countertops, stainless appliances and 18' ceramic tile. The downstairs master bedroom has a large walk-in closet, cherry cabinets and garden tub in bath. Upstairs you will find 3 large bedrooms, a spacious loft (which can easily convert to a 5th bedroom) and a huge bonus room pre-wired for surround sound (perfect for a home theater or game room.) This is a SHORT SALE opportunity. Please allow 30-90 days for decision from seller's lender.